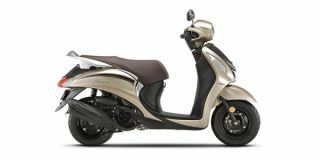 The Yamaha Fascino is among the most stylish scooters on sale in India. No prizes for guessing that it has taken its design inspirations from the iconic Vespa scooter. The styling has played a pivotal role in the success of the Yamaha scooter as finally consumers had the option of a great looking scooter that was affordable, unlike the Vespa. Yamah a have also introduced its popular scooter in dual-tone shades as part of the 2017 update. The stylish scooter gets a single-pod analogue instrument cluster.